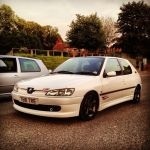 Right my Bianca Rallye is going up for sale, it's been on the forum for a few years. I bought it off Silky, who bought it off Wilyoldave. It is extremely tidy example! Sits on standard Cyclones refurbed and powder coated anthracite, all 4 of these are perfect, not a single mark on any of them. They are all wrapped in matching Michelin Pilot Exalto 2's with plenty on tread. Front brakes are a refurbished set, this was only done last year, pads are EBC redstuff and have done less than 1000 miles. It is lowered on 60mm G-max springs and the rear beam was removed from the car last year, stripped downed, cleaned up and re-greased and lowered to match the front. It has a Peco back box which makes a nice sporty sound and fits the cut out nicely. It has a K&N Panel Filter in the standard air box. There is an OMP upper strut brace fitted and also has Pug Racing gear rods. The headlight are Phase 3 crystals and have headlight covers. Inside there is and Alpine MP3/Ipod head unit. I have the standard back box, standard headlights, standard springs so all this could be changed very easily. The overall condition is great, there is a couple of stone chips on the bonnet, the bumper doesn't really have any though. There is a small crack on the rear bumper that I've pictured. The interior is very good, there is just a small rip on the drivers bolster but I have a spare genuine Rallye rear bench that is included, so material could be taken from this to perfectly repair the mark. I really do love this car, I'd love to keep it and I know i'll regret selling it but i'll have my 205 gti6 out this summer so this just won't get used. Not interested in any p/x's, cash sale only £1700. I'm putting this on ebay too but id rather it stayed on this forum. Thanks, have a think and let me know. I'd love to see it go back to you. Dont buy a vw over a pug though! pleasure to deal with you thanks Mike! ^^This - I flew from Bristol to Inverness to get my Rallye from Golspie and drove it 560 miles home.